When I bought the car it was in a pretty good condition. But the interior had suffered the most during the cars life. The drivers seat had torn and was a bit saggy. I short, the entire interior just looked a bit tired, dirty and a little funky. And beside all that, it must have been one of the most boring interior I had even seen in a car. Flat grey from front to back. So it was obvious from the beginning that the interior would have to be completely reupholstered. Now, I am lucky enough to have a brother that went to a car upholstery school. After completing that, he has started his own part-time business company for reupholstering all sorts of automotive parts. He has agreed to do my car as well and we have already talked everything through as to what my wishes would be, what was possible and what kind of materials I would want in the car. It's not going to be super original or very special. But it is going to be nice and clean and will suit the car if you ask me. I'm just a sucker for black leather and red stitching. It just looks very stylish and sporty at the same time. And my brother has already done the first few parts for me. 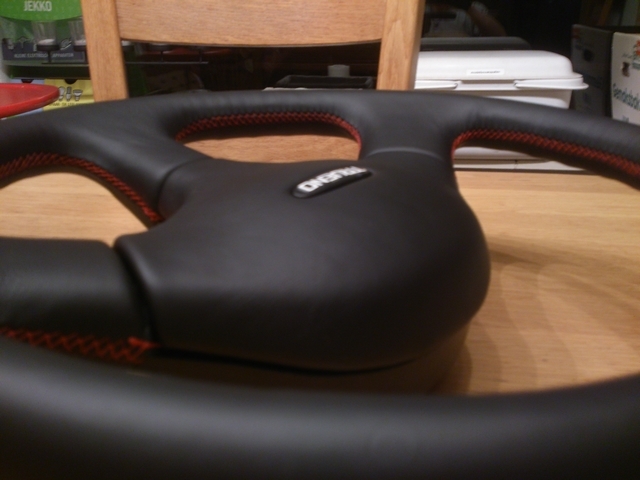 I managed to get my hands on a nice new steering wheel to replace the incredibly ugly USDM steering wheel. 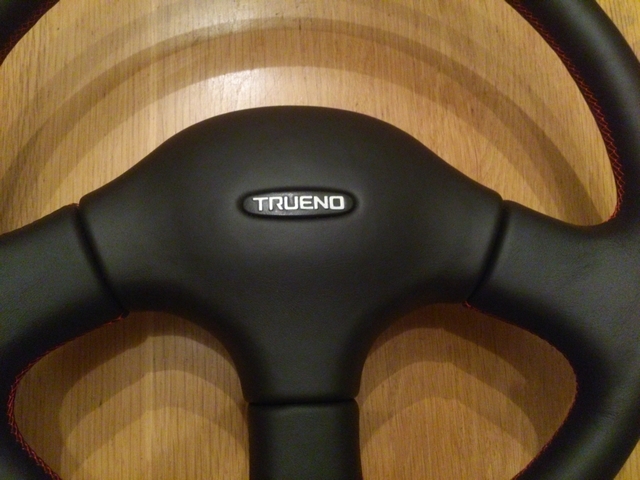 The new steering wheel came from a Japanese Sprinter Trueno and has a 'Trueno' badge in it that really suits the car. It was already upholstered with black leather, but it had also seen better days. And although you can get these steering wheels in leather, the center piece od the steering wheel is always still done in plastic. If you ask me, that just doesn't look right. So I asked my brother if he could fix that for me and upholster the center piece of the steering wheel with leather as well while he was at it. He came back with the steering wheel and it looked even better than I had even imagined! He had some scraps of luxurious Napa leather and used that for my steering wheel as it just feels so good. Some finishing touched really like the repainted Trueno badge set it apart. And I really like the small things like the center seem at the top of the steering wheel acting like a subtle center mark. 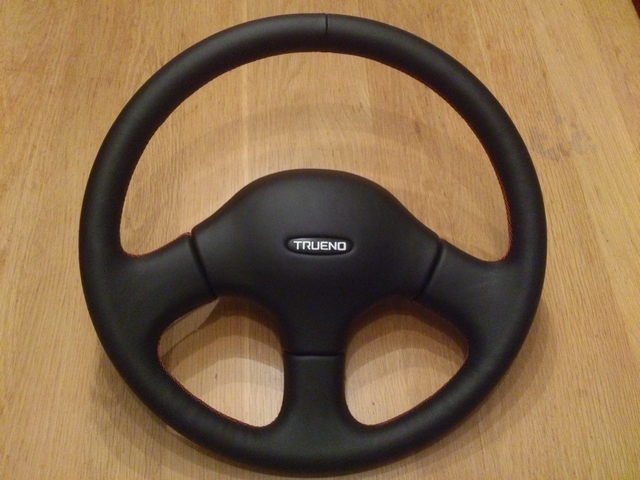 The upholstered center piece of the steering wheel with the repainted Trueno emblem. And it was all neatly stitched with a nice red thread. 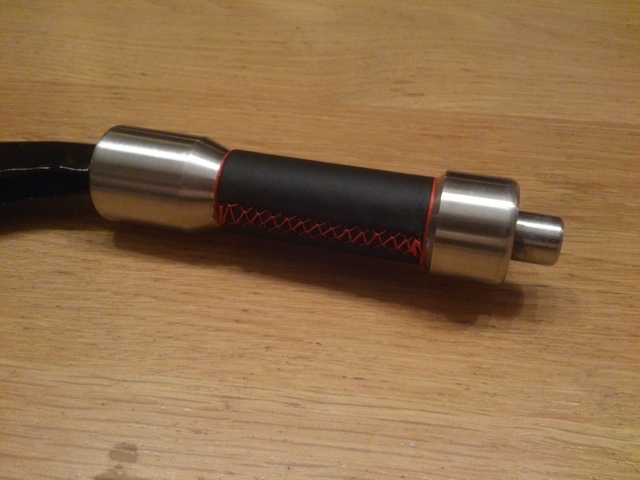 He also did my home made handbrake lever handle at the same time. I had already wrapped it in black tape once to visualize how it would look if it was upholstered too. But now with the real thing on, it looked even better. 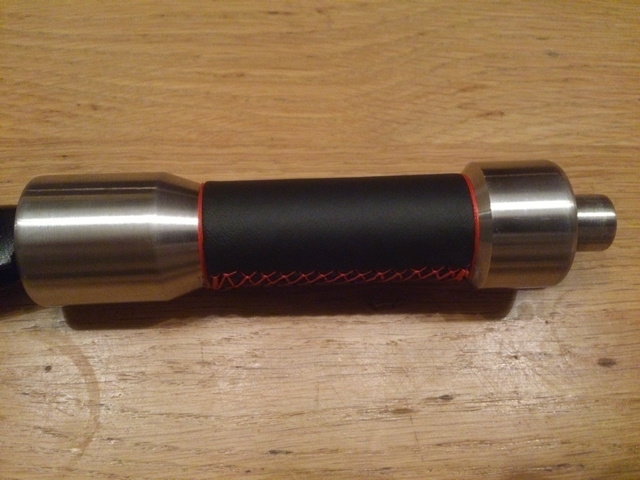 It matches the rest of the interior now with the black nappa leather and red stitching. To top it all of, he had wrapped the thread around the ends of the leather to really make it stand out en look good. The center console of the car has an armrest. Not only is it an armrest, but also the lid of a large storage compartment in the center console. Now, having a armrest is already pretty nice. My old hatchback didn't have one and although I didn't really miss it at the time, I just didn't know what I missed out one now that I do have one. But constantly leaning on a hard piece of plastic isn't really nice. So I asked my brother to reupholster that for me as well and put a little padding under te leather for comfort. 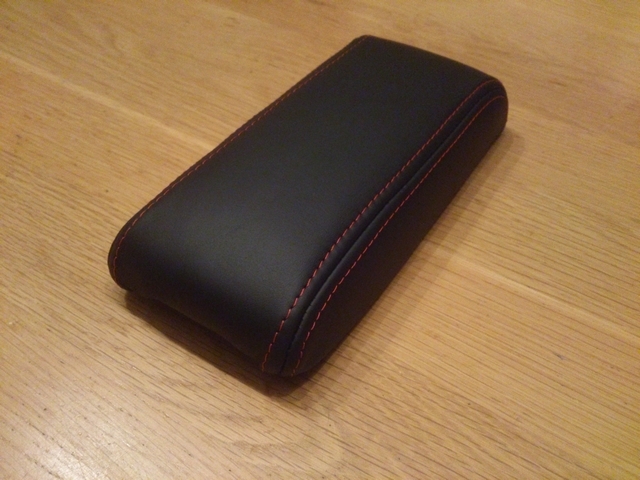 And again, to let it all match the rest of the interior: finished with red stitching. The rest of the interior will be done when we come around to it. Much of it is still needed for fitting things etc. and since I don't want to damage nicely new upholstered parts, I'll just wait until I'm done with them and then hand them over to my brother.